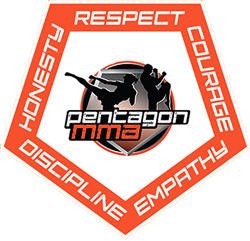 At Pentagon MMA, we believe that every child deserves a chance to become an amazing, successful human being. Mixed Martial Arts is a powerful character-builder and one of the most practical and complete forms of self-defense. Pentagon MMA’s After School Mixed Martial Arts Program is a fun, structured, and educational program for your children that focuses on Character Education, Martial Arts Education, and Physical Education in a safe, positive, and supervised environment. Your children will learn essential life skills, including discipline, respect, focus, self-control, teamwork, and gratitude, all while improving their physical condition and health. They will also explore their creative side with a weekly arts and crafts project. Our After School Mixed Martial Arts Program is NOT A DAY CARE or a “babysitting” program, but an educational program where your child will be provided with world class Mixed Martial Arts instruction by our experienced and award winning staff. We pick up your child in our comfortable, air-conditioned van at their school at either their regular or early dismissal schedule and bring them back to our school. After arriving at Pentagon MMA, they change into their Gi (martial arts uniform), store all their belongings, have a healthy fruit or vegetable snack provided by Pentagon MMA, and do their homework. The afternoon will end with an engaging and structured mixed martial arts class that includes a motivational life lesson. Your child can be picked up between 5:45pm and 6:15pm. WHAT IS INCLUDED IN OUR AFTER SCHOOL MIXED MARTIAL ARTS PROGRAM? OUR AFTER SCHOOL PROGRAM HAS LIMITED AVAILABILITY AND FILLS UP QUICKLY. CALL US AT 703-521-1000 OR EMAIL US AT INFO@PENTAGONMMA.COM TO GET YOUR CHILD STARTED TODAY!